migration or occurrence concerns (e.g., regulations that require recovery of “free-product” regardless of thickness, recovery to prevent potential LNAPL migration, or recovery for aesthetic or non-technical reasons). In 2009, ITRC published LNAPL-1: Evaluating Natural Source Zone Depletion at Sites with LNAPL (ITRC 2009b) and LNAPL-2: Evaluating LNAPL Remedial Technologies for Achieving Project Goals (ITRC 2009a) to aid in the understanding, cleanup, and management of LNAPL at thousands of sites with varied uses and complexities. These documents have been effective in assisting implementing agencies, responsible parties, and other practitioners to identify concerns, discriminate between LNAPL composition and saturation-based goals, to screen remedial technologies efficiently, to better define metrics and endpoints for removal of LNAPL to the “maximum extent practicable,” and to move sites toward an acceptable resolution and eventual case closure. This guidance, LNAPL-3: LNAPL Site Management: LCSM Evolution, Decision Process, and Remedial Technologies, builds upon and supersedes both previous ITRC LNAPL guidance documents in an updated, web-based format. LNAPL-1 and LNAPL-2 are still available for review; however, LNAPL-3 is inclusive of those materials with new topics presented and previous topics elaborated upon and further clarified. evaluate the implemented remedial technologies to measure progress toward an identified technology specific endpoint. Initial development and continued refinement of the LCSM is important to the identification and ultimate abatement of site-specific LNAPL concerns. Figure 1-1 identifies the stepwise evolution of the LCSM, the specific purpose of each LCSM phase, and the tools presented within this guidance to aid in the development of the LCSM. As depicted, the LCSM is the driving force for identifying actions to bring an LNAPL site to regulatory closure. Figure 1-1. 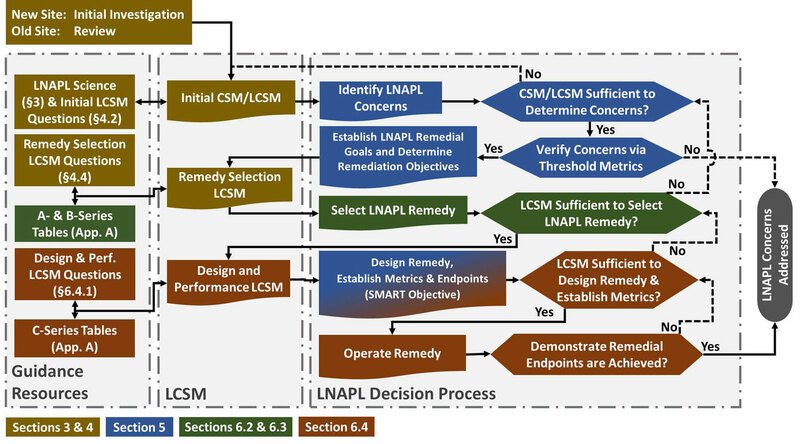 LNAPL remediation process and evolution of the LNAPL conceptual site model (LCSM). Section 2 identifies some of the challenges implementing agencies face when investigating, evaluating, or remediating LNAPL sites. These challenges include regulatory or guidance constraints, a lack of familiarity or understanding of LNAPL issues, and poorly or undefined objectives and strategies. This section also stresses the importance of identifying and communicating with stakeholders early in the process in order to address issues or concerns that can lead to delays or changes in strategy. Understanding and recognizing these challenges and concerns during development of a comprehensive LCSM can help reduce costs and lead to a more effective and efficient resolution at an LNAPL site. Section 3 provides an overview of key LNAPL terminology and concepts including LNAPL behavior following a release to the subsurface (i.e., how LNAPL spreads away from the primary release point, its behavior above and below the water table, and how its migration eventually stops and naturally depletes). An understanding of these basic terms and concepts is crucial for developing a comprehensive LCSM and an effective LNAPL management plan. The LCSM is a component of the overall conceptual site model (CSM), and emphasizes the concern source (i.e., the LNAPL) of the CSM. The presence of LNAPL necessitates an additional level of site understanding. The unique elements of the LCSM are presented as a series of questions for the user to answer to help build their site-specific LCSM. Ultimately, a thoroughly-developed, initial LCSM provides the basis for identifying the LNAPL concerns associated with an LNAPL release. Section 5 describes the decision process for identifying LNAPL concerns, verifying concerns through the application of threshold metrics, establishing LNAPL remedial goals, and determining LNAPL remediation objectives. This section also introduces remedial technology groups, the concept of a treatment train approach, and how to transition between technologies to address the identified LNAPL concern(s) systematically and effectively. It is important to understand the content of this section prior to selecting and implementing an LNAPL remedial strategy. Section 6 describes the remedial technology screening, selection, and performance monitoring process. This section begins by identifying technologies recognized as effective for mitigating specific LNAPL concerns and achieving site-specific LNAPL remediation objectives based on the collective experience of the LNAPL Update Team. The LNAPL Technologies Appendix summarizes each of the technologies in detail and presents a systematic framework to aid the user in screening out technologies that are unlikely to be effective, ultimately leading to selection of the most appropriate technology(ies) to address the specific LNAPL concerns. This appendix describes in more detail each of the 21 LNAPL technologies introduced in the main document. The A-series tables describe information to evaluate the potential effectiveness of each technology for achieving LNAPL goals under site-specific conditions. Information includes the basic remediation process of each technology, the applicability of each technology to specific remedial goals, and technology-specific geologic screening factors. The B-series tables describe information to evaluate the potential implementability of each technology considering the most common site-specific factors. The C-series tables describe the minimum data requirements to make a final technology selection through bench-scale, pilot, and/or full-scale testing; they also describe metrics for tracking remedial technology performance and progress. This appendix provides a technical overview of NSZD for LNAPL and the methods by which rates can be estimated and measured. It also provides a discussion of long-term LNAPL site management and how NSZD can be applied as a remedy including decision charts to support integration of NSZD and case studies demonstrating its use. For this document, the original ITRC NSZD document (ITRC LNAPL-1) was updated and incorporated into the main body and appendix. LNAPL transmissivity has application throughout the life cycle of a LNAPL project. This appendix provides an understanding of how transmissivity connects to the broader framework for LNAPL management including LNAPL recovery and mobility, and the potential for NSZD to decrease LNAPL transmissivity and mobility over time. This appendix describes the behavior and differences of how LNAPL behaves in fractured bedrock formations. While some of the same physical principles apply for multiphase flow in fractured aquifers as in porous aquifers, unique characteristics of finite and restricted fluid flow paths can lead to unexpected results in fractured settings. This appendix details how LNAPL sheens form, the concerns and challenges of sheens, and potential sheen mitigation technologies.